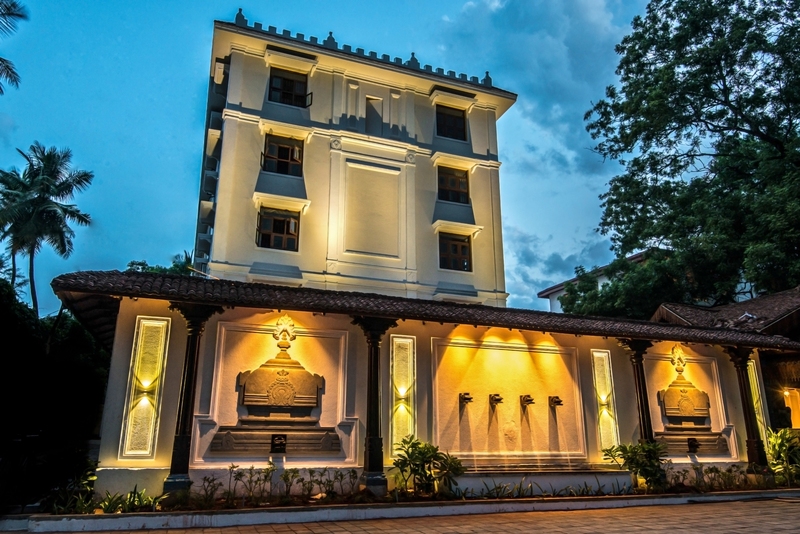 If you are a lover of all things related to heritage and culture, then a visit to Svatma – Thanjavur’s (or Tanjore’s) first luxury heritage property is a must. Literally meaning ‘Ones’ Own Soul’, this is the city’s first every luxury property that promises to take you on a journey of discovering arts, crafts and more. 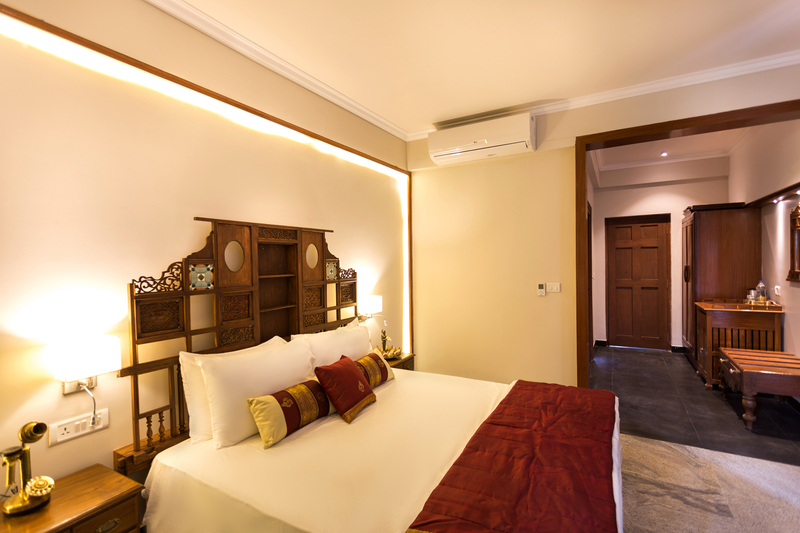 Svatma blends almost seamlessly into the culturally rich city of Tanjore. Staying at a heritage property is always something I count on as it has a story. And the story of the founders here is also equally as interesting. 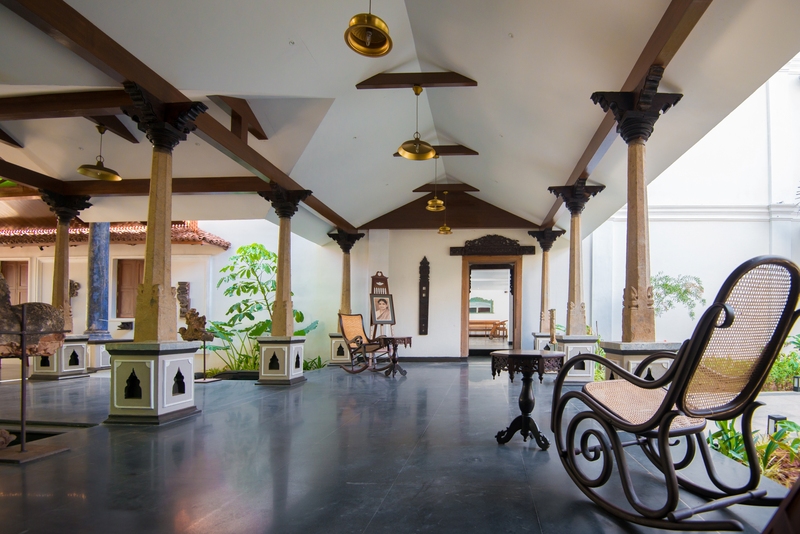 Krithika Subrahmanian, Founder who self admittedly lives and breathes design and construction, says she has been deeply influenced by her early training in classical Indian dance and love for history of architecture to design this space. “With the experience of having designed and executed over 1200 projects over 19 years of practice, it is my time with my inner psyche to delve into the wealth of vernacular architectural traditions and analyze what gave energy to these built forms. The conceptualizing of these monumental structures could never have been a chance idea. The technique of pro portioning and fractal geometry in plan is most definitely a synthesis of various practices and knowledge banks,” she explains. Svatma is under the ownership of Sreshta Leisure Pvt. Ltd., a private enterprise wholly owned by a family. Naturally there are no standard rooms in this property and each of the 38 rooms are unique. The seven rooms in the in the heritage building are built as a elite family residence over a hundred years ago has been carefully restored. “At Svatma, the residency becomes a journey in itself. A voyage of discovery of the self and an ethereal immersion in the arts suspended in time,” says Krithika. The accommodation is designed to resemble private rooms within a large elegant family home with verandahs, hallways and lounges spaces that have a personality that connects to you. Svatma offers traditional Tamil vegetarian fare and you can try this at three of their F&B outlets. At Palaharam, sample the traditional coffee made using a special hand-poured filter, traditional health drinks and gourmet ethnic snacks. The home style pure vegetarian fare is simple yet appealing and easy on your taste buds. The in house restaurant Aharam is the all day fine food diner with a traditional display kitchen that overlooks the pool. The unique menu will take you on a culinary journey of Tamil Nadu and you must try their exclusive bouquet of plated mini meals that is aimed at health watchers who like to experiment with the flavours of the region. All ingredients are organic and made by trained specialist chefs. At Nila, you can experience dining under the stars as this is a terrace dining restaurant on the rooftop just like how the zamindars of yesteryears ate! The resort’s gym and yoga centre aptly called Arogyam is manned by experienced tutors who guide you to do both asanas and meditation. To relax head to Soukyam, the luxury spa that has four private treatment rooms as well as a relaxation area for foot and shoulder massages. 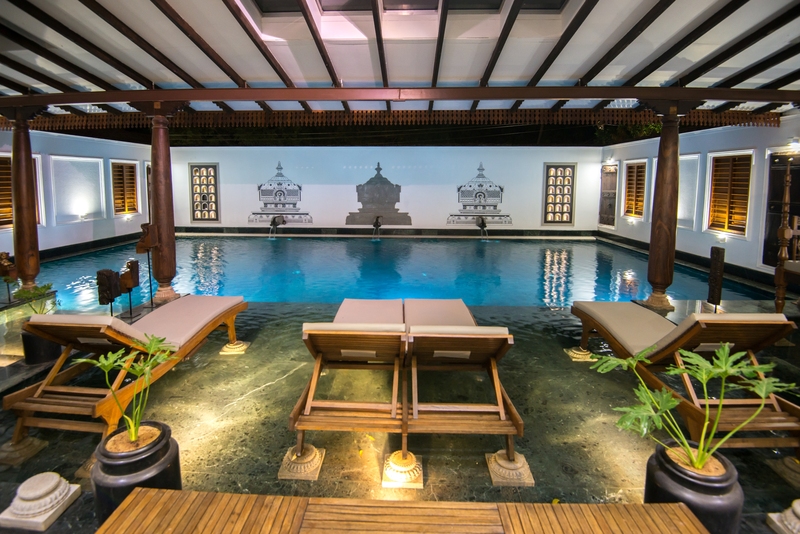 The swimming pool is fitted with Jacuzzi and lounges for relaxation. 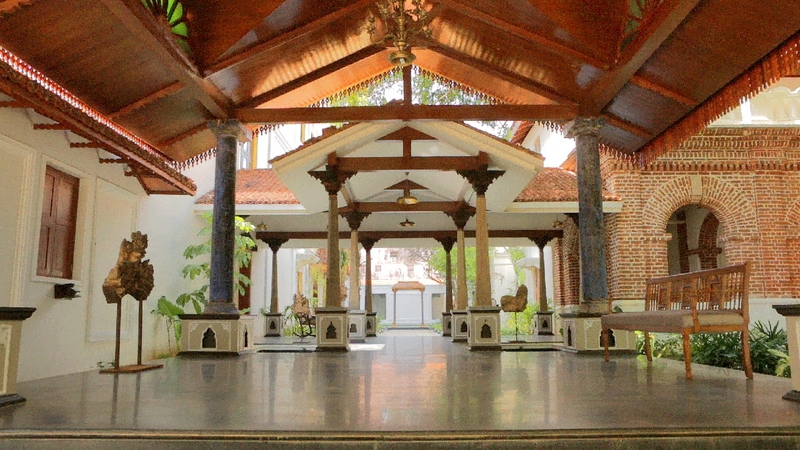 Conferencing facilities include Divyam a 250 seater hall with a colonial ambience and Gautama, the main hall of the heritage building for smaller groups. Tanjore is a shoppers delight and the best part is that this is where you can pick from the choicest of handicrafts. Svatma has an in house store Sri that has a carefully curated collection of products, accessories, artefacts and art including antiques. The best part is that these are of the best quality and ecologically sensitive so you have a mix of tradition and contemporary in them. 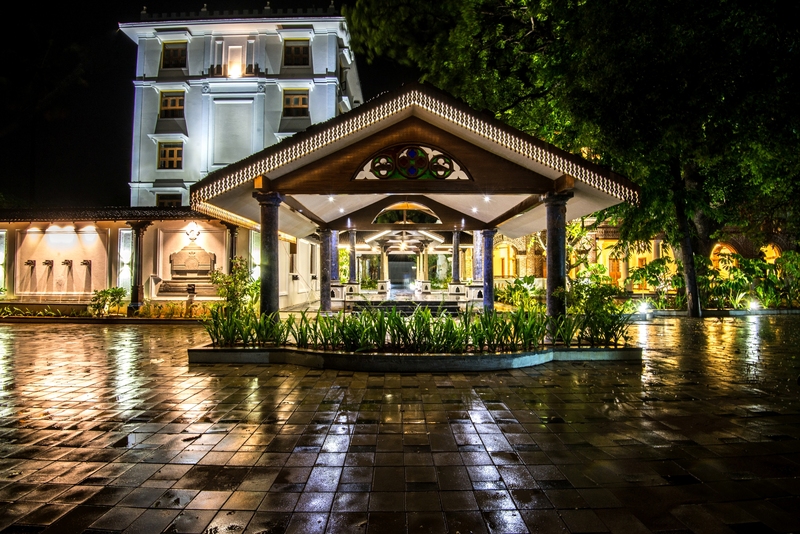 The resort is designed to bring together a range of experiences which is the primary differentiator here so be prepared to be charmed by the arts, architecture, culinary heritage and culture of ancient Tamilnadu. So while you are here you can take a cooking lesson in the special guest experience kitchen where you are given personal training on how to make simple vegetarian local food with an emphasis on nutrition and health. If you are interested in arts, you must attend the bronze casting demonstration of the famous lost wax technique by master craftsmen, a speciality of the region. For spiritual satiation, check out the chanting of the Vedas by priests with the inherent meanings explained and learn how to chant Gayathri Mantra and Shanti Mantra. If music appeals to you, attend the concert by vocalists, percussionists, flautists in carnatic tradition with a discussion on how moods change with ragaa renditions is a must. There is also a lecture demonstration on Tanjavur style of dance the Bharatanatyam by proficient dancers. You can also have the resort organize a visit to temple site with an academic expert who will take you through the restoration, architecture and iconography. Likewise there are also sessions demonstrating handloom weaving and wearing techniques and the famed Tanjavur painting technique with gem stones inlay work. Tamil Nadu is well known for its cultural prowess and if there was one place it all comes together it is here at Tanjore. Historically, an important centre of art, culture, spirituality and architecture, this is where you can see the great Living Chola temples that have been rightfully tagged as UNESCO World Heritage Monuments. Start with the finest specimen of temple architecture, Brihadeeswarar temple rightfully referred to as the Big Temple a majestic structure dating back to the 11th century. In its sprawling complex you will find the Saraswati Mahal Library that houses over 30000 Indian and European manuscripts. The Thanjavur Art Gallery in the Nayak Durbar Hall of the palace complex is a repository of bronze and stone sculptures from the 7th to 18th century. You can also visit the state handicrafts centre Poompuhar to pick up the Tanjore paintings and a range of souvenirs. If you have the time you can also visit the nearby towns of Thiruvaiyaru, a town known for its music, Tiruvarur, once the capital of the Chola empire, Chittanavasal Cave known for its murals, Thirueeyachur Temple and the town of Kumbakonam for its myriad temples. Just like Svatma’s logo of a pair of Swans looking intently at each other, depicts reflection on one’s own soul, the temples, art and architecture of Tanjore will help you in your own journey of self realization! Svatma is a great tribute to the city and its time for you to pack your bags to experience this little paradise for yourself.